Margie's Crafts: FREE shipping starts today with Stampin' Up! FREE shipping starts today with Stampin' Up! Wahoo! I love when Stampin' Up! offers FREE shipping and the best part is that there is no minimum order amount. It is like getting 10% off every single order this week. Now is the time to stock up and save lots of $$$! 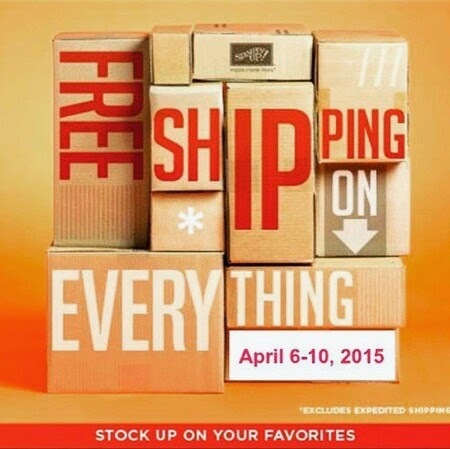 But don't wait because the FREE shipping is only good April 6 - April 10, 2015. Stock up now on all of your crafting basics such as paper, bling, ink refills etc. The 2013-2015 In Colors are retiring very soon! Order as much or as often as you want this week because it all ships for FREE! Earn FREE stamps when you shop with me! Check out the details for my Stampin' Points program. Orders that are placed and shipped to Hawaii and Alaska get free 2nd Day air shipping. Paper Pumpkin past kits and kit refills are eligible for free shipping if purchased online but the monthly subscriptions are not eligible for this free shipping offer.